"Challenging But Worthwhile Book Explores Truth As An Avenue To Enlightenment"
Encourages you to examine a lot of ideas about how human beings operate and offers new perspectives that you might find useful. The author has a lot of knowledge and expertise in the field of psychotherapy and is honest in addressing its strengths and weaknesses. Doesn't use overly-scientific language and tries to be relatable to the average person. Most of the book is the author's personal opinion, there isn't really any studies or proof to back up his claims. Not the easiest to implement, and some of the ideas are a bit 'out there' and could be difficult to comprehend. This is a polarizing book that some people are going to love and some are going to hate. The author presents the case that lying is the biggest cause of stress, and that complete honesty is the only way to be free and to grow, both individually and in your relationships. The idea of radical honesty is only one part of the book, and arguably not even the most focused on. It delves a lot more into the role that our mind plays in our life, and how for many people it's the cause of most suffering. In a lot of ways this book reminded of The Power Of Now, and if you liked that book then you might enjoy this as well since the message is largely the same. If you haven't read much self-help work before this will be a difficult place to start. If you want a book that covers the topic of honesty and is more specific to dating, then we suggest you check out Models: Attract Women Through Honesty. Note: This is a review of the book only and the value for money rating is a reflection of this. If you purchase an audio version the price will be higher and the value for money may be lower. I am writing this book because I want to become famous. I want a lot of people to know my name, now and after I die. I want to be known as a great intellect, and perceiver, and I want to be smarter than anyone else. More precisely, I want to be thought to be smarter than everyone else. The pleasure of imagining other people imagining me smarter is an experience of warmth, a dull but pleasant sensation accompanied by a slight smile and an inner vision of people reading my book and talking about me with excitement, like my wife Amy and I do reading Friedrich Nietzsche, who is long dead. 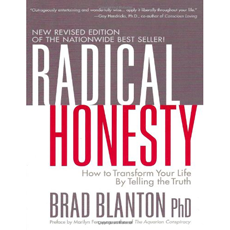 So says Dr Brad Blanton, the author of Radical Honesty, on his motivation for writing this book. You could never accuse Blanton of not practicing what he preaches, as he is nothing if not honest about himself throughout. Unlike most other books that are written by doctors, scientists or intellectuals, Blanton isn't afraid to swear or tell it exactly like he sees it. He openly admits psychotherapy fails more often than it works, and that when it does work it's more the result of the patient than any great ability he himself has. There isn't a ton of scientific jargon here, as it's written for the layman. However it does have a 'new age' and spiritual slant to the writing at times and if you prefer books that are very practical and grounded in reality, you might find this a tough read. The main theme throughout the book is that people have become a slave to their own mind, unable to really notice what is going on around them and just experience the present. This in itself isn't anything new and is the basis behind a lot of eastern spirituality and meditation, as well as being brought to the masses in the book The Power Of Now. As we grow, we learn to interpret our experience in order to survive. We eventually become capable of caring for ourselves, but our survival techniques can, and often do, eventually kill us. What kills us is intense attachment to our interpretations and failure to distinguish these interpretations from sensate reality. This process of learning to categorize experiences, and then forgetting the distinction between categories and experience itself, is what I call learning how to lie. In essence, we don't see things for how they really are. We see them based on our interpretations of how they are. If you apply this to dating then it can be a very profound concept to grasp. Quite often men have trouble being in the present moment with a woman and noticing what's actually happening. Their minds are creating an interpretation of reality, based on beliefs, past experiences, judgments and a whole host of other factors. It should be noted that not everything in this book is presented as conclusive fact. Blanton is giving his take on things, some of which other experts agree with and some of which they don't. Some of the things he says make a lot of sense and some seem like a bit of a stretch, so you'll have to take what works for you and discard what doesn't. For example, something he refers to as the 'first truth' revolves around the idea that we are all trying to get back to that state of unity and being that we first experienced in the womb. That we can all unconsciously still remember this feeling and that all religion and philosophy is an attempt to get back to this state. To me this was something that stood out as a bit more abstract and bizarre and it's a central theme that runs throughout the book, a bit of a paradox to the more practical and grounded advice that's presented. For most people, telling the truth begins and ends with number one. Blanton goes into why this isn't enough, and makes a compelling case for the power of radical honesty in helping to get past pain and anger so that you can move past the issue. In the context of relationships, this is easier said than done. For example, if you have cheated on your partner, he advises going into extreme detail in a way that you would never think would be healthy or helpful. In fact, he admits things will get worse before they get better. But he explains why feeling and embracing any anger and grief is necessary and allows for the love you shared to be killed off so it can be reborn. It's tough to describe here in a short amount of space, but it's an interesting concept and worth exploring. There's a case study presented at one point featuring a married couple who were patients of Blanton's. To make a long story short, when the wife was able to practice radical honesty and fully embrace her emotional reaction, she was eventually able to set herself free and move on. The husband was unable to do so and eventually committed suicide. Blanton's takeaway point is that the mind has the power to create a reality in which the being kills itself to escape the mind. Radical honesty is the solution so that you can begin to take control of the mind instead of letting it control you. It might be worth noting that Blanton himself has been married four times, so he's not claiming he is an expert at making marriage work. Although he does say his current marriage has lasted for 19 years and he attributes that to being older and wiser. He does state that he believes romantic love is overrated, and that with honesty and communication you can have a wonderful relationship. This was in relation to a couple he was counselling where the man admitted he wasn't in love with the woman anymore, but was still encouraged by Blanton to stay with her. I found this surprising, as it seems like telling someone to settle for what they can get rather than what makes them happy. One of the reasons to learn dating skills is so hopefully you won't end up in this same position. The second level of truth telling here is often the one that women feel guys are missing. Women often relate better to emotions than to facts, and if you don't reveal your true emotional self to women they can feel a disconnect. Learning how to do this effectively is really important for long term relationships and while still useful in casual dating, not as important here. The third level of truth telling here is arguably the most difficult but also powerful. It's basically tearing down the walls on the image you have created for yourself and destroying your ego, your idea of 'self'. In a long term relationship this could be incredibly helpful for really creating an unbreakable bond and deep connection. For guys who are playing the dating game, it's also particularly relevant. If you've always struggled with women then it's likely you have a self-image of a guy who isn't good with women and you'll benefit by destroying that. Equally, once guys in the dating community get good with women they often build an identity around this fact, which actually makes them worse as they don't want to risk shattering this self-image and to preserve it they cease taking action. So there's a lot of interesting ideas presented here that can help you in the context of your relationships with other people and also the way you see yourself and the way in which you operate. It's definitely a challenging book but worth it if you are interested in this kind of thing. In all likelihood implementing everything that Blanton recommends here is going to be very, very tough for most readers. The idea of radical honesty is only one part of the book, and arguably not even the most focused on. It delves a lot more into the role that our mind plays in our life, and how for many people it's the cause of most suffering. In a lot of ways this book reminded of The Power Of Now, and if you liked that book then you might ejoy this as well since the message is largely the same.